Join us for the Spring Hike at Cedars of Lebanon State Park at 2:00 PM on Saturday, 18 March 2017. We will hike the beautiful 2 mile Cedar Forest Trail to see what early bloomers are emerging. Meet at the first parking lot on the right past the Main Park Office. This is a Ranger Guided Hike on a moderate trail with some elevation. Free and open to the public. All ages welcome. No strollers, please. Also, stop by the Nature Center on March 18 to meet Lori Jill Smith and Jane Banks Campbell, authors of the new book Tennessee State Parks, Postcard History Series. Lori and Jane will be signing purchased copies of their book beginning at 1:00 PM. The story of Tennessee’s state parks began more than 80 years ago when New Deal agencies worked to rebuild portions of Tennessee’s eroded landscape. Along with these conservation measures, the state’s early parks were created through the development of recreational areas. The Tennessee Valley Authority built dams that contributed to recreational attractions, and the Division of State Parks was started in 1937. All of these efforts in addition to Tennessee’s natural beauty have resulted in 56 state parks. Through their postcard collections, the authors invite readers to discover each park’s special place in Tennessee’s history and landscape. 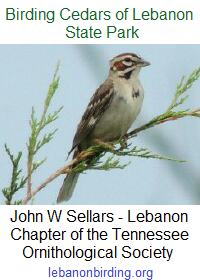 This entry was posted in Announcement, Public Event, Public Notice and tagged cedar glade, Cedars of Lebanon State Park, friends of cedars of lebanon, Lebanon TN, Tennessee State Parks. Bookmark the permalink.